What's The Middle Ground Between Grammar And Voice When Teaching Writing? There's very little research on how to effectively teach writing and few pre-service teachers explicitly learn how to teach it in credentialing programs. And yet good writing has become a central skill for most subject areas, including math and science, where teachers are now asking students to explain their thinking. Many teachers use model texts and writing assignments rooted in students' lived experiences to give kids practice writing. Proponents of this approach say too much focus on grammar and sentence structure stunts the individual's voice. On the other side of the debate are people like Judith Hochman, who believes writing should be taught starting at the sentence level. Before writing paragraphs — which is often now part of the kindergarten curriculum — children do need to practice writing great sentences. 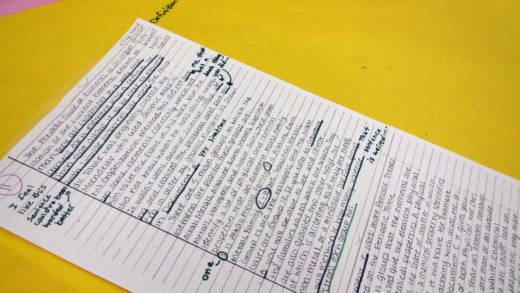 At every level, students benefit from clear feedback on their writing, and from seeing and trying to imitate what successful writing looks like, the so-called text models. Some of the touchy-feel stuff matters, too. Students with higher confidence in their writing ability perform better. All of this points toward a synthesis of the two approaches. In classrooms where practices like freewriting are used without any focus on transcription or punctuation, “the students who struggled didn’t make any progress,” Dr. Troia, the Michigan State professor, said. But when grammar instruction is divorced from the writing process and from rich ideas in literature or science, it becomes “superficial,” he warned.